Things happen quickly in the world of baby development and Baby Fifi has turned into a lean mean cruising machine. 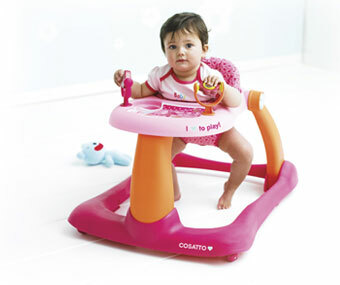 A little rocket with her baby walker, she flies across the room beaming smiles of happiness at her new independence. She is literally walking on sunshine. There is just one thing, she is utterly frustrated with her lack of ability to turn the walker around and spends much of the day sulking about it. That is until her brother gets involved, then a full scale walker fight begins; “no, mine SHARE” he shouts. I try to intervene; “Err, no actually that’s Fifi’s walker, you don’t need it anymore”. “NO. MINE.SHAAAARE”. 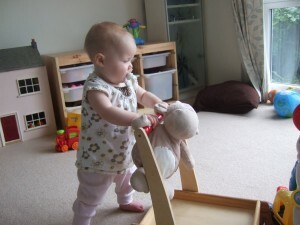 There is no arguing with a toddler. I bet your bum is rock hard from all that dragging toddler/baby around. There are people in the gym paying lots of money for this extra workout, and you get it all for free, yay! I whole heartedly agree with Met Mum. Built in resistance training! I will vouch for the toned quality of wifey&#39;s bum, and the overall quality of it too boot. Mmmmmm. Exactly. Who needs the gym. I remember the stage you are in so well. The taking an hour to walk to the end of the road stage. Maddening! Work is defintely a break.